Discussion in 'Mapping Questions & Discussion' started by pisaman2, Jun 27, 2009. 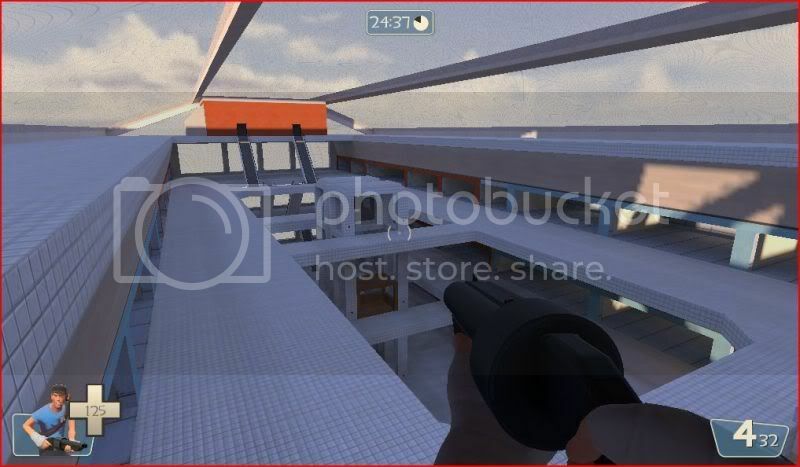 Looking at the in game screenshots of the unfinished map I have just taken, I'm not certain it has the 'tf2 style' graphics. Maybe this is because it is in a completey different un-desert style or I haven't added props or proper textures for the shops and stuff. There is also a lack of detail which I need to put in. Also, would it have an OMG dramatic!1! effect on the style if I used chair or table props from hl2 for the food court? One last important thing, as you can tell from the pictures below, you can jump from the top escalator to the bottom. My main concern is that it is just a quick alternative to using the elevator or escalator. You do sacrifce a bit of health. Do I need to change this (if possible). Also, please tell me what you think and give me funny shop names. Thanks for reading the wall of text and enjoy the pictures! EDIT: I have now split the mall up. There is now a giant wall in-between the two lifts. Each team will have a 'department'. I'm hoping this will reduce lag. Its way too open and most likly will become very laggy because everything will be visable at once. Ok, there are another few small areas. There is a food court with a small hole in the floor (something inspired by a local mall lol) which drops into another equally sized room where intel is. I didn't show screenshots because I have not added lights in them yet so it's too dark. Have you/anyone got any suggestions where abouts I could maybe cover some parts up enough to reduce lag? Also, I have modified the map. See the edit in my 1st post. Mall maps only really worked in HL1, and this was because "brush" based detail was acceptable and you could represent an isle of produce with a single texture on a flat face. Source demands more than the previously utilised modified quake engine and people will expect more as a result, especially with the fact that 5 years ago HL2 had some pretty decent shelved item scenes. So they know shelves full of dynamic props (prop_physics) are possible. The problem comes when you are rendering any more than say, perhaps 50. Particularly in multiplayer. You will have to do some fancy optimisation within your map, to make it not so packed full of detail at anyone time that it becomes unplayable. Plus there's the added dynamic prop limit for multiplayer maps. Or atleast TF2. It is going to be so incredibly hard for even an experienced level designer to pull this off, there is a reason why mall maps don't exist and how only completely newbie mappers suggest such a project. This is because anyone else realises that it's nigh impossible to pull it off to any worth while degree. 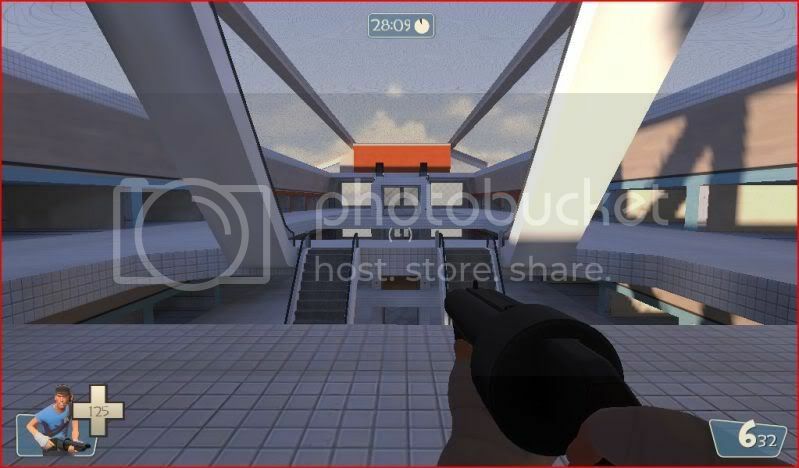 As if unavoidable unchangable technological limitations wern't holding you back there's also the fact that almost no prop in the TF2 library could be utilised for your maps chosen location/theme (a mall). 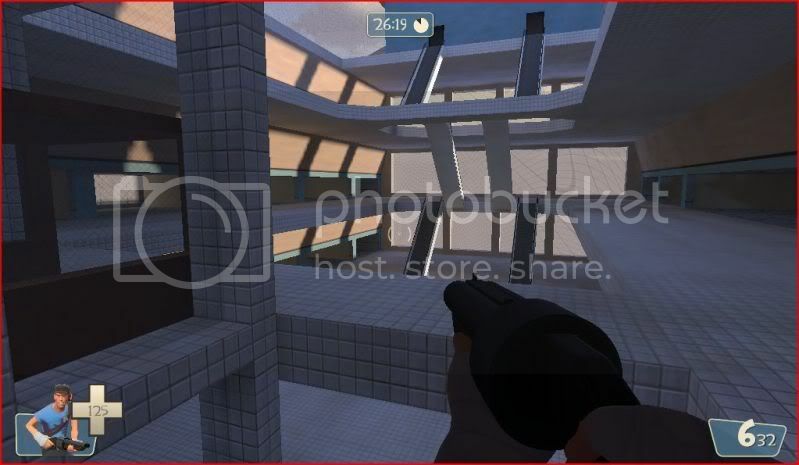 Plus, without severely clever usage of the current TF2 texture bank i also see your map becoming visually monotonous. An "abandoned" theme would allow you to close alot of the shops (ie, covered by sliding metal doors with nothing fancy to render). You could use areaportals to split the floors and separate each open shop so that only shops with entrances visible in real time will get rendered. Tho, this will have an in-game processing cost, its not a big issue if it efficiently keeps the overdraw down. The biggest problem has been stated tho. Its way too "open". There's relatively no areas in the map where you can't see the whole thing at once. Not only will this impact performance, it will make it sniper hell. Try to imagine some theme that will cause the mall to broken into sections. The only thing that comes to mind is some kind of architecture altering damage (in layman's terms, it was blown up) to the structure, tho, that's more a L4D technique. One of the many maps I never released while I was learning was an attempt to recreate the Venture Compound (see, Venture Brothers). It looked nice, but ran like crap and was just way too open. In essence, fundamentally flawed. I could have salvaged it with the some creative changes that strayed from the source design, but I was lazy/easily distracted so I moved on.